In 2008, over 20 million US workers had no health insurance. If we had just maintained the same coverage rate we had back in 1979, over 12 million of these uninsured workers would have had health insurance. The full details, including breakdowns by workers' wage levels, are out today in a new CEPR report by Hye Jin Rho and me. 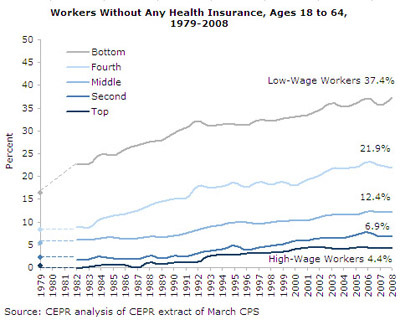 Here's a graph of the share of workers without health insurance by wage quintile. Almost 40 percent of workers in the bottom fifth of the wage distribution have no health insurance from any source, public or private.